Last year about this time, the media said they didn't report the good news in Iraq because they couldn't find any good news. Now, there is more good news than bad, and yet they seem to have gone largely silent. Why is that? "News about *a Beagle* vs. Important *positive' news on Iraq. Which one gets air time? Need you ask?" Unlike the puppy-haters at VC and elsewhere, I am glad to see dogs receiving their proper attention. What we need to do is find a way to get the celebrities off TV, so there is time to report on both Iraq and dogs. When Maj. Brian Dennis first spotted a scruffy German Shepard-Border collie mix at a fort in Iraq, the dog wasn't interested in making friends. The dog, who lived in the wild with a pack of canine companions, had already been through a lifetime's worth of pain and neglect. His ears had been cut off as a puppy, and he had been trained as a fighting dog. Now that he was finally free of his tormentors, the dog just wanted to be left alone. But Dennis saw something special in the dog, which he nicknamed "Nubs," because of his missing ears. It took some time, but eventually Dennis had the dog eating out of his hand. One day, when Nubs showed up one day with a deep wound in his side, Dennis nursed him back to health. Soon, Dennis and Nubs were inseparable. Sadly, Dennis learned that his unit would be forced to relocate to a new base, and he wasn't allowed to bring Nubs along. As he watched Nubs race alongside his Hummer as his unit drove away from the fort for the last time, he was sure that he would never see the dog again. But two days later, a familiar face turned up at Dennis' new base: Somehow, Nubs had managed to follow the Marine unit through the Iraqi desert on foot, all the way to their new base – 70 miles away. "I won't even address the gauntlet he had to run of dog packs, wolves, and God knows what else to get here," Dennis wrote. "When he arrived he looked like he'd just been through a war zone." "Uh, wait a minute, he had." Even though it was against military protocol, Dennis' unit felt compelled to give the determined dog a home. They built a doghouse for Nubs, but were soon informed by the military police that Nubs would have to live elsewhere. So, Dennis decided to take Nubs home with him. Click through for a picture of the Marine Major and the happy hound. This, of course, proves my point. Dogs and Iraq, yes -- Brittney Spears, no. What should the governing principles be in cases like this one? The Republican Party of Texas, and by extension, Senator John Cornyn, has requested that I release my military records to them. The fellow goes on to say that he was planning to do it anyway; but while he's at it, he takes several swipes at "cronies" planning a "smear campaign" and "dishonest attacks on veterans." There are few nobler callings than the call to run for elected office. [*coughcoughcough* Excuse me. --Grim] We applaud your answering that call and wish you the best of luck in your primary against Misters Kelly, McMurrey and Smith. They then provided him with a letter (on Republican Party stationery, even) to sign that would authorize the release of all his records. The letter strikes me as an audacious document, and though it is kindly worded, the underlying concept seems unsavory. I don't mean to say that an opponent should never be able to ask after the nature of your service. Especially if you are running "on military service," an opponent might reasonably ask, "Well, what sort of service did you provide?" Making release of your personal records a mandatory condition for running for public office might discourage a good officer with an indistinguished career; or a man with a highly distinguished career who nevertheless did not wish to discuss certain aspects of it. Citations for bravery and valor, in particular, can be the sort of thing you'd rather not talk about. We understand there are a host of reasons for that, some highly honorable and sympathetic. I'd like to say, then, that it's legitimate to mention that you chose to serve, without necessarily being obligated to sign away all your privacy to every military-generated document about your service. The political process is nasty enough as it is, already far too much about the politicians themselves and too little about the concepts and ideas they want to enact; and even the best of men, perhaps especially them, may not wish to discuss certain things about their past. There probably is some threshold beyond which it is legitimate for an opponent to ask for at least some records to be released. This particular fellow seems only too ready to sling mud to claim that he's running a pristine campaign that ought to be immune from dirty campaigning; but it should be possible to run one. If we can make it possible, perhaps someone will. Gateway Pundit has some reports and photos, including a press release from our own 6-8 Cav. Apparently, the devices are popular with everyone from shop keepers to police. I know I really shouldn't be feeling this evil pleasure at reading the report. It's a mark of how flawed I am as a human being. Since Eric wants to do FARK stories today, I feel absolutely obligated to post this one. Two men obviously thought James Pickett, 80, was an easy target when they showed up at his home on Saturday with a knife. "He just came through that door, stabbing and beating," said Pickett. Captain Clint Pullin said it looked as though the men wanted to kill him. He's a WWII veteran, former firefighter and lifelong John Wayne devotee.... What the men didn't know is Picket had taken a pistol and put it in his pocket before opening the door. "He jumped and turned and I shot him," Picket said. The two brothers, Paul and Holden Perry, ran but didn't get far before calling an ambulance. A bullet just missed Paul Perry's spine. That's a shame. You should always have plenty of bullets. Teflon Don, author of Acute Politics, has gone and returned to Iraq. Not as a soldier, but as a photo journalist. If nothing else, taken together with people like Michael Yon and Michael Totten, this war is going to improve journalism somewhat. Take a look. Wish him well. The thread at FARK is, as they say, 'chock full of win'. THE MORALITY OF GOVERNMENT INTERVENTION. Brad Lips & Carrie Lukas have written a very serious article about the morality of government aid. You can read it here. This is an issue that our country needs to discuss seriously. Increasingly, the popular attitude concerning government aid is an unquestioning assumption that, as President Bush said, “When people hurt, government must move.” Our country needs a serious discussion about this assumption and conservatives must lead that discussion before the law of unintended consequences lead us down The Road to Serfdom. Labels: Conservatism, Economics, entitlement mentality, Politics, Studies in Accepting Monetary Bribes to Tarnish one's Honor. 40 And presaerve ye well social cohesion." 44 You othere faelows can't denye[.]" Yeah, Chaucer would have liked that a lot. In the thesaurus, the antonym of honesty is lying, and the opposite of arguing is agreeing. But in the minds of teenagers, that’s not how it works. Really, to an adolescent, arguing is the opposite of lying. That's right. A fighting man can be an honest man; but an agreeable man is a liar. Certain types of fighting, despite the acrimony, were ultimately signs of respect—not of disrespect. But most parents don’t make this distinction in how they perceive arguments with their children. Dr. Tabitha Holmes of SUNY–New Paltz conducted extensive interviews asking mothers and adolescents, separately, to describe their arguments and how they felt about them. And there was a big difference. Forty-six percent of the mothers rated their arguments as being destructive to their relationships with their teens. Being challenged was stressful, chaotic, and (in their perception) disrespectful. The more frequently they fought, and the more intense the fights were, the more the mother rated the fighting as harmful. But only 23 percent of the adolescents felt that their arguments were destructive. Far more believed that fighting strengthened their relationship with their mothers. One of the key insights into the duel as a social institution was that its chief function was a display of mutual respect. Kenneth S. Greenberg explained, in Honor and Slavery, the way in which the duel allowed existing disrespect and tension to be resolved. When two men stood up and tried to kill each other, they were each also allowing the other to try and kill them. Allowing a man a fair shot at you, and taking your fair shot at him, showed that you existed on an even plane. The fight was intended to heal a rift in society, precisely because it was a show of respect between the parties. Indeed, that was often its effect. Fighting is a form of negotiation, they say. An honest form. So what matters more: honesty, or peace? There are civilizations -- China, I can say having lived there, is one of them -- where the greater good is harmony, before which truth must yield. Arabian society is also that way; we say that, if all but one sheikh agrees, no sheikhs agree. You have to achieve complete harmony or you have no bond that will be recognized. These are difficulties for Americans, who prefer honesty. We are consequently very, very good at fighting. In which Cassidy looks at some Apache guntape. BloodSpite is reflecting on eight-second rides. Many years ago I made it to the Las Vegas National Finals Rodeo. Not as a watcher. I've ridden a horse or two that belonged in a Rodeo, but I haven't ridden in the show. Nor will I -- I'm already too old to think that's a good idea. :) Blackhawks over Iraq are far less dangerous than any bad-tempered horse, in any corral in the safest state back home. Bold, new fresh face for change. I work with some women who have a passing resemblance to Ms. Williams. And believe me, you do not want to be on the receiving end of that look. Oh, and while we're at it, Penn, (of Penn and Teller; the magicians) says Hillary is toast. LT G and his troops conduct a presence patrol somewhere in Iraq. 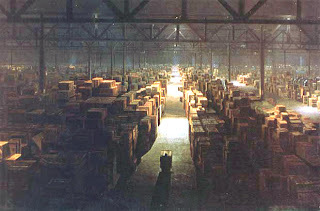 At the end of Raiders of the Lost Ark, the magical weapon-to-end-all-weapons, a "radio to God," is sealed away in a government warehouse, marked "Secret." This seems to be the reflexive reaction of governments to powerful, dangerous things. Having held a security clearance and read secret documents on a regular basis, I have often felt that the government vastly overclassifies -- and that it should find a way to get the information out, so that the citizenry can know what is going on. That is one reason this page is a longtime friend of Secrecy News, which always keeps pressure on the government to declassify robustly, and fights against new restrictions designed to keep unclassified information from the public. It looks like a schoolgirl's lesson book. The cover bears a repeating flower motif in hot pink and white. A few words handwritten in Arabic fill a small title field on its face. "Register of Eliminated Villages," Mr. Makiya translates aloud, running his fingers over the words. The book, Mr. Makiya says, records the Baath Party's destruction of 399 Kurdish villages in the Eastern sector of Northern Iraq in 1987. There's an interesting debate on the best way to secure and publicize the remnaing several million pages of the regime's secret files. Brave Iraqis trying to build something here want them: academics, who are afraid to send these resources back to a place where they may be destroyed if a hostile faction gets ahold of them, are resisting. There's no way to know what bombshells those files hide. For a country still trying to come to terms with its role in World War II and its life under a totalitarian regime, that half-destroyed paperwork is a tantalizing secret. The machine-shredded stuff is confetti, largely unrecoverable. But in May 2007, a team of German computer scientists in Berlin announced that after four years of work, they had completed a system to digitally tape together the torn fragments. That project isn't a pipe dream: the reason China has an atomic weapon today is that they were able to reconstitute shredded Soviet documents. American secrecy is of a different type, not intended to conceal tyrannical acts, but to protect operational security and give planners a moment to think. The problem doesn't arise from a desire to conceal vicious deeds, but from a lack of interest: once a thing is stuck in the warehouse, it is forgotten. That said, in a Republic the flow of information to the citizens should be as unimpeded as reasonable. We have a role as citizens in giving assent to the government, and advice through both elections and peaceful assembly and petition; we have also, therefore, a genuine need to know and to understand. A robust, lawful and orderly declassification process is the way to match the needs of the Republic and the citizen, with the operational security requirements that protect our servicemembers, agents and officers. The impulse is to lock things in the warehouse, and never think of it again. We need to have someone whose job it is to always be reviewing those boxes, and thinking about which ones can be brought out into the sun.